Female genital mutilation (FGM) is internationally recognized as a human rights violation. UNFPA, jointly with UNICEF, leads the largest global programme to accelerate the elimination of FGM. 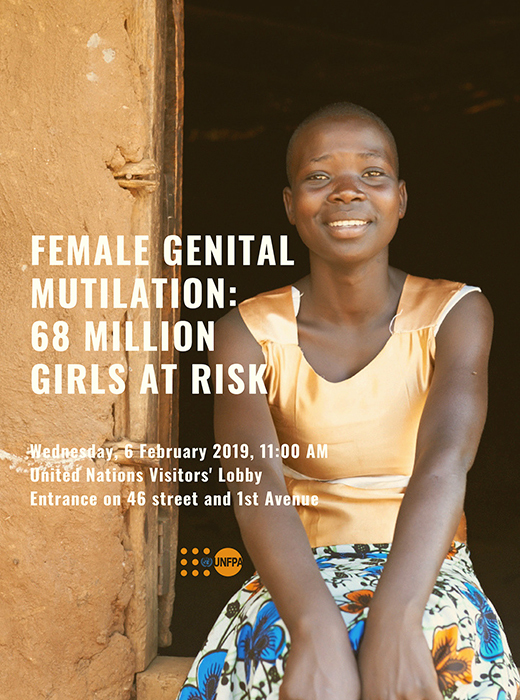 To mark the International Day of Zero Tolerance for Female Genital Mutilation, UNFPA is organizing a photography exhibition that sheds light on a harmful practice that is still prevalent in many parts of the world. The 68 Million Girls at Risk exhibition, co-hosted by the alternative media movement Dysturb, showcases young women who represent a new generation of leaders. Each one of them was born into a community that has traditionally practiced FGM, and yet, after becoming educated about the risks of this practice, they have become champions in the effort to end it. We invite you to join them in this effort by making a commitment today to ensure that 68 million more girls and young women are not subjected to this human rights abuse. Volunteers around the world pitch in to help protect girls at risk – linking grassroots and global action, and generating data that strengthens the push to end FGM. Unless change comes faster, by 2030 another 68 million girls will undergo female genital mutilation.